Mexican Indigenous Textiles and clothing - A vanishing tradition of indigenous dress, clothing and costume presented as an on line museum. Mexican textiles are known as traditional costumes and dress includes embroidered blouses, wrap skirt, huipils, back strap woven belts, quechquemitls,rebozos know in Mexico as ropa tipica. Textile patterns from Mexicos rich ethnic culture and village life is presented and museum store. 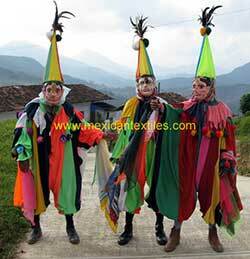 Groups / Textiles from other States Huasteca of San Luis Potosi Mayo of Sonaora Otomi of Queretaro Cucapa of Baja Ca. N.
For every example here there are a thousand more in the field. Mexican textiles have existed for more than 7000 years, but now in many villages’ traditional embroidered blouses, back strap woven huipiles, loomed quechquemitls and belts are worn only by the grandmothers. Mexico's indigenous textile culture is in danger of extinction. The embroidered designs on blouses and huipiles are particular to specific towns and ethnic groups. The textiles identifies the groups and villages that various textiles come from, sometimes it is ribbons or the way they comb their hair. The 7000 years old time line ends with these grandmothers. These wonderful colorful textiles link the indigenous peoples with culture and cosmovison of their native culture. As grandmothers, daughters and granddaughters sit with other family members to make the garments they discuss style, techniques but something else more important, behaviors, customs of marriage, child birth, the herbs used for healing, how to make a tamales etc. These links are lost staring into the one eyed Cyclops that is the TV or washing floors in the DF. When Cortez came to Mexico almost all the women wove cloth for garments and ceremonial use. It is natural that these talents gradually disappeared in the face of European machine made goods and now over time the Asian dynamo and its inexpensive clothing. However it is not natural that the long cultural heritage of Mexico indigenous textiles be abandoned to the scrap heap of history, not without some sort of attempt to conserve this incredible rich cultural treasure. The Spanish in all their colonial institution drilled into the population that to be an Indian was the bottom of the heap. These conquered people have been passed down from the Spanish to the Mestizo population that now rules Mexico. This mestizo population has continued the discrimination of the Spanish towards the “indios” , It is no wonder that most Indians want to leave that part of them selves behind. Below are some of the principal factors leading to the decline of the use and manufacture of indigenous textiles in Mexico. They are personal observations based on an intensive 6 year study of the pueblos de Mexico. Recently in the Sierra Zongolica the operator of a ECO tourism center with support from the CDI and other government institution left to go the US to pick oranges for a year. In every village, without exception, people migrate to the US out of desperation, true they sometimes send money back to support the town festival but they return with ideas of modernization. Traditional dress is viewed as a marker of the old ways. They almost never wear traditional clothing again and in some cases there wives give it up also to be modern. 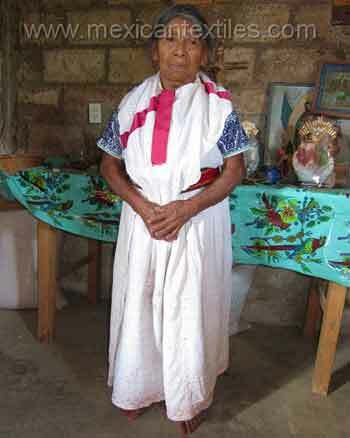 In Santiago Mexquitlan this woman was photographed in traditional dress in January 2005 , when returning to deliver her photos 6 months later , she no longer was wearing her costume ( uniform) . When asked why, she said that she worked in Toluca and no one wore costume there and if she wore her costume, they ( the mestizos) would stare and laugh at her. Who are the Cholos , no it is not another indigenous group, well not a historical one, they are young men and women who have left the village to work either in Mexico City or the US and return dressed as gang members who resent or hate their culture. They influence the younger kids by bad example. Recently in some Totonacan towns in the Sierra Norte of Mexico I obeservfed a group of 20, some with spiked hair, dressed in black with pierced tongues and noses, they seem like they landed there from another planet. 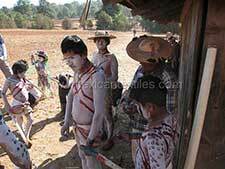 A village elder said to me that they come home and act badly and “se sienten hombre” which means they feel like men. Some years ago in Santa Anna Hueytlalpan, Hidalgo I noticed a black wrap skirt hanging on a cloths line. Inside the compound there were young women washing and chattering, we struck up a conversation. The conversation gradually drifted to the black wrap skirt, it turned out to be their grandmothers. I asked if they had one, with a tone of ridicule in their voices they said they would never wear that since it made them look like grandmothers. In the embroidery town of Zoatecpan, Xochitlan de VS, Puebla I was shocked to see the rapid transition among the younger women. Only 4 years ago it seemed the 80% of the people in town wore a traditional blouse. This Christmas at the town’s festival the number was down to 50% or less. The daughter of the head of the textile co-operative was wearing modern clothing, why I asked. She replied that she didn’t like it. On the floor in the living room was a magazine of TV stars. On any given day there is not a word about indigenous communities or their customs in main stream media. TV is almost entirely filled with reasons not to wear indigenous clothing as can be seen on almost all Telenovelas, Just imagine a woman , who after 35 years gets a TV and watches “Rubi” all they can think about is how ugly, fat, poor and forgotten they are and how much they want to be someone else. .
Outside of Channel 22 and 11 both public educational channels there is not a word about indigenous people, almost nothing about indigenous dress and sometime the only visual hint that there are 15 million indigenous people in Mexico is a vase or some sort of handicraft as a prop on the studio set. In the Casas de Cultural we can find a smattering of presentations dedicated to indigenous peoples and there crafts and the Museum of Arte Popular does a reasonable job of presenting these forgotten people. As with many other social and cultural events in Mexico the presence of these shows that occur all over Mexico City and beyond are under reported. Some times take the metro and get off at every stop to see what notices have been posted. – In the early 1970 during the heyday of hippie Peasant wear fad, I exported 10000 garments a month. These were gathered from all over Mexico and shipped them to Nuevo Laredo where my friend Caesar would consolidate and drive the goods into the US. One day I arrived to do my customs entry and he had on the most stunning Guayabera shirt. Since I was buying Gauyabera shirts wholesale at $15 from the Yucatan it peaked my interest. I will never forget that and what it meant for textiles from Mexico, this was 1972. In the town of Huehuetla Hidalgo , Maria a Tepehua weaver makes 4 quechquemitls a year they sell for 1000 pesos. That is out of the reach of all but a few people in the town. Compounding the issue she is the only weaver left that can weave a quechquemitl. 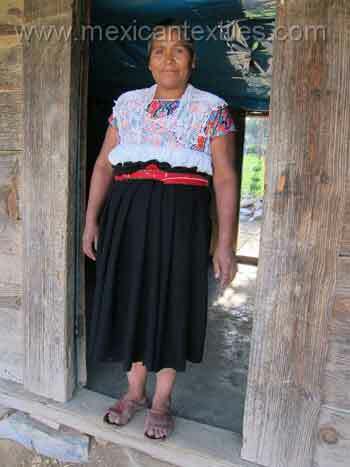 In the Totonacan towns along the Trans Serrano highway, an embroidered blouse cost $70- 150 pesos, the Totonaca belt cost $600 and the skirt and slip cost 250 . In the Tuesday market 2 blouses, a skirt and a sweater made in Asia cost 250 pesos. I have seen jeans for as low as 70 pesos. In the town of Huehuetla Hidalgo , Maria a Tepehua weaver makes 4 quechquemitls a year they sell for 1000 pesos. That is out of the reach of all but a few people in the town. Compounding the issue she is the only weaver left that can weave a quechquemitl . Marias daughters wear western cloths, spea Tephua and do not know how the weave the quechquemitl. Maria says that it is to much work for them to weave. In the Mixtec weaving communities along the coast, traditional costume is confined to the oldest generation. Weaving skill have been past on and there is a large number of women dedicated to weaving , using traditional methods but not no many traditional garments. 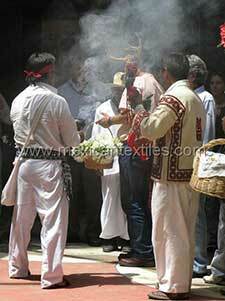 There are also garments made to look like traditional but were never worn or used before. 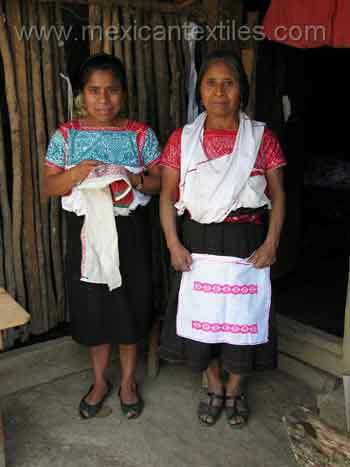 Tamazulapan Mixe – there has been a rapid decline in the peop0le wearing the white huipil and the dark blue wrap skirt, this in turn as reduced the number of weavers who make these items. Some have turned to making rebosos for resale. Quality degradation – When I lived in Ocotlan De Morelos Oaxaca in the 1970 many Zapotec women work the famous San Antonio wedding dress, but not as a dress it was used as an undershirt. During the late 1960’s and through the 1970’s the style of embroidery was made into a dress. The Zapotec embroiderers of the day had a polish skill and the dress actually had some cultural meaning. Today the sad quality of these dresses leave a person that has seen and knows the classic blouse or dress when only a glimmer of its past glory. They continue to sell but the younger generation no longer uses them. From time to time an older woman will make one for her daughter to wear but the classics are not history. The quechquemitls from Chachahuantla, Puebla, were originally a hand knotted lace, they then moved to a commercial material with heavy machine embroidery, recently the women have been switching over to a solid store bought gauze quechquemitl. It is almost impossible to find 100% cotton material in any indigenous blouse and even in traditional huipil synthetic fiber is slipping in. There are a few reasons for this cotton cost more than cotton / synthetic blends and colors are faster in the synthetic yarns. The yarns can also be embroidered 2 or 3 x faster than the traditional cotton thread and this makes the blouses easier to commercialize. In many cases the quechquemitl is a key indicator of how things are going , among the Totonacan women of the Sierra Norte of Puebla , hand woven or knotted quechquemitls have been entirely replace with store bought lace. Only 10 years ago the quechquemitls of store bough lace had embroidery on them . In the municipality of Zongozotla I noticed a fashion transformation happening, instead of the white store bought lace some women were using colored lace for their quechquemitls. The thing is that the white lace was a direct descendent of the back strap woven cotton quechquemitl which is also white. The quechquemitl made from colored machine made lace losses that connection. In the Sierra Zongolica of Veracruz, road building has help people to escape the poverty of the region, recently in a village outside of Xoxocotla I found no women wearing traditional costume, apparently the church had been telling the women for years that it made them look Indian. Summary – The movement of indigenous people towards the main stream of Mexican Society is well underway, the education system, government programs, road building, TV and immigration all play their part. The long history of discrimination and marginalization plays a large part in the desire NOT to be viewed as indigenous by the younger generation. These young people relate more to modernism as an escape, than to ancestral duties and customs. So they gladly change from poor Indians to poor Mexicans, they do this by not speaking the ancestral language, not dressing in indigenous specific ways and denying thier heritage. The diverse indigenous costume in contemporary use. WHY are traditional costumes disappearing? The Mexican Indigenous Textile project documents the traditional dress of Mexico’s Indigenous people. This effort began in 2001 and is on going. The idea is to leave a solid field based photo ethno- historical work of the first 15 years of the 21 st century. 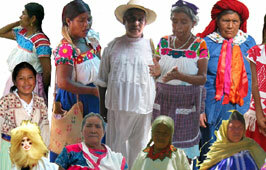 In Huauchinango Puebla, there are 28 Nahuatl speaking villages and 2 Totonacan. With the help of the municipal authorities I was able to visit and document them. There are three distinct types of costume in the region. The first type is from the lower regions and is considered the “Huauchinango type” the second occurs in the highland villages and is very similar to the traditional costume from Naupan. The third type from the 2 Totonacan villages is in very limited use. 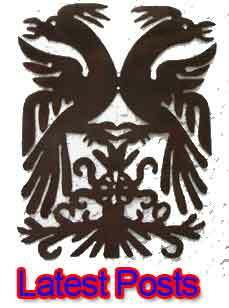 Click the on the picture above to enter the indigenous world of Mexico. These are all the villages that are currently documented. Just pick any one to start the adventure. These are just a few examples of the situation all over Mexico. This project began based on a textile collection of over 400 pieces and has as its purpose the identification of Mexican indigenous textiles and costume. Each village or region has distinctive clothing, both embroidered and woven. The documentation of these textiles includes pictures of the communities, women and men wearing traditional clothing, examples of the different textile patterns from the specific village and example from the collection. This project has gone beyond the documentation of the collection and now has over 850 villages documented. 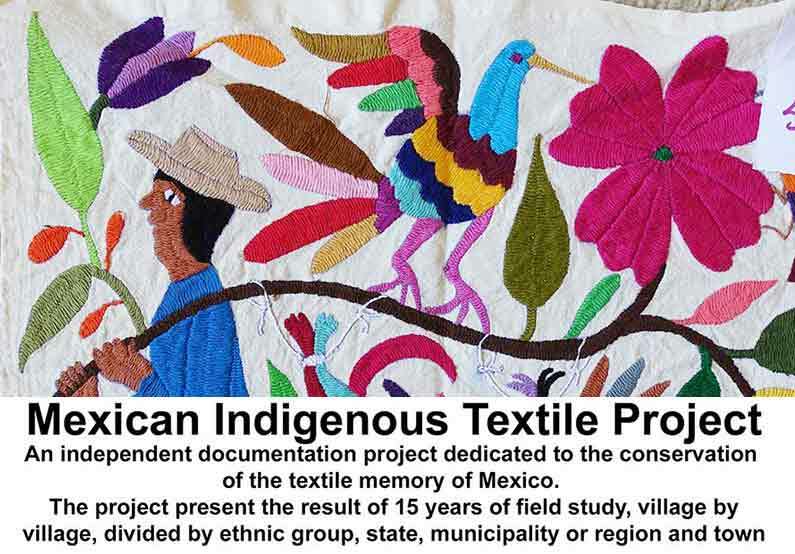 The Mexican Indigenous Textile project is presented as an on line museum which provides graphic evidence of the locations and type of traditional clothing worn in the villages, in addition in many cases an we make an evaluation of the extent of the extinction. As you browse the website you will notice a great number of grandmothers, in many communities they are the last. It is not only indigenous dress that is under pressure but all sorts of other customs which provide the rich cultural base that is formed by Mexicos over 60 ethnic groups. Pottery, woven palm and other grasses, medical healing and shamanistic practices, that have serves these communities for thousands of years are rapidly passing into extinction. In some of the northern Mexican groups on three of four people still speak the indigenous language. There are many areas of Mexico where traditional cultures are still strong, however they are more and more like islands rather than regions. Weaving church decoration in Hueyapan Puebla. Video - Tetelcingo, Morelos belt weaver. Video- Valle Nacional embroidery collective filmed Feb 2001.